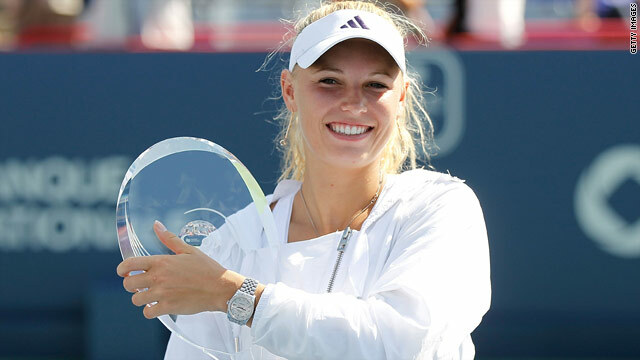 Caroline Wozniacki holds the Rogers Cup after beating Vera Zvonareva 6-3 6-2 in Montreal. (CNN) -- Caroline Wozniacki made light work of Vera Zvonareva to claim the Rogers Cup crown in Montreal just hours after winning her semifinal. The Dane won 6-3 6-2 in just one hour and 14 minutes after completing her semifinal earlier on Monday due to the torrential rain that washed out most of Saturday and all of Sunday. Wozniacki, the world number two, disposed of Svetlana Kuznetsova 6-2 6-3 in her last four clash, after only two games had been possible on Saturday. Zvonareva had earlier booked her place in the final after number ten seed Victoria Azarenka retired hurt during their semifinal, but she was blown away by her 20-year-old opponent in the tournament's climax. After being broken in her opening service game, Wozniacki recovered to break back instantly and quickly wrapped up the set. Wozniacki's dominance continued in the second set as she gave her Russian opponent the runaround to maintain her impressive hard court form this season. Wozniacki earned $350,000 for her win and now boasts three titles in 2010 - a feat matched only by world number four Kim Clijsters.